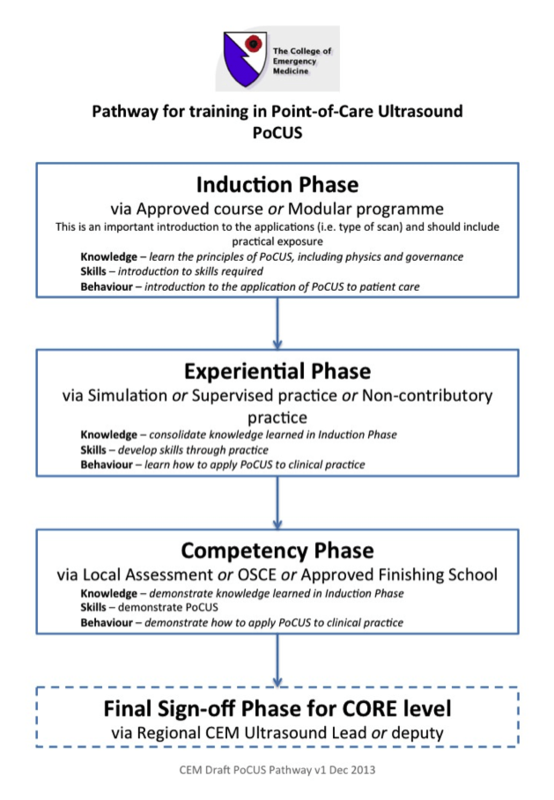 POCUS became a mandatory element of ED training in the UK and Ireland in 2010. Ireland is affiliated with RCEM UK and follow the same guidelines for training. Step 1 Attendance to a level 1 course. There are several running in the UK and as part of the BSTEM training programme RSCI runs a course for trainees several times a year. See list of courses for links. Keep a portfolio of scans performed- easier said than done. Keeping picture evidence of scans performed as either printouts or electronic copies is essential. Ensure when you start you know how to do this on your local equipment otherwise it can prove time consuming and difficult putting together cases to write up. Eportfolio users can use reflective notes section to create a logbook in one place. The more people you scan the better. Get to know what’s normal and how to adjust settings to get better images. The college used to ask for 10 AAA/FAST/Vascular access as a minimum. It’s a good start. Attendance at a finishing school to show off your cases and ultrasound prowess is the final step for signoff as core (previous level 1) competent. They involve an OSCE style assessment by accredited assessors, and review of cases. It is mandatory for CCT of ED training.